It's hard to measure Jackie Robinson's achievements strictly through numbers. Was he one of the game's greats? Absolutely. But he's also so much more. The first time he stepped out onto a major league field, Robinson took a tremendous leap in righting one of baseball's wrongs. In breaking the game's color barrier, Jackie Robinson made history. But simply stepping on the field wasn't enough. Jackie Robinson endured and excelled. He was, and still is, a hero. 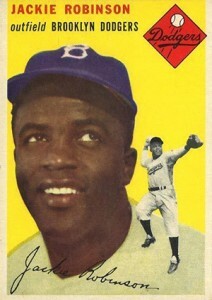 Jackie Robinson cards continue to resonate today, capturing the career and enduring spirit of Robinson's achievements. Shop for Professionally Graded Jackie Robinson cards on eBay. There is certainly no shortage of Jackie Robinson cards to collect. His earliest cards and collectibles can be extremely expensive. However, collectors who look to some less popular issues can find some nice early cards at surprisingly reasonable prices. 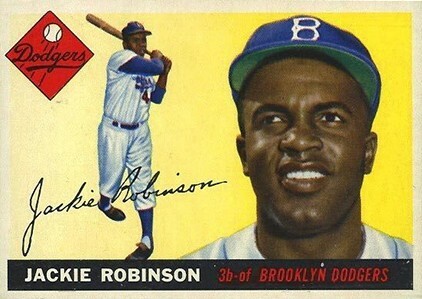 Below is a look at some the most notable vintage Jackie Robinson cards of all-time. When available, linked sets in the descriptions for each card go directly to detailed profiles. 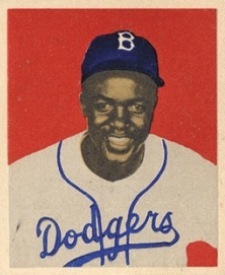 Recognized as one of the first Jackie Robinson cards, the 1947 Bond Bread Jackie Robinson features a portrait, a blank back and rounded corners. They were distributed with loaves of Homogenized Bond Bread. There are other versions of the card with square corners and a slightly different tint on the back. These are believed to have been produced a couple of years later. 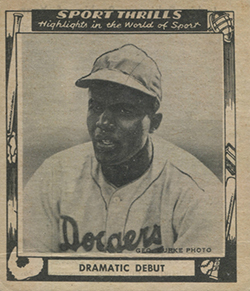 Bond Bread also made a special promotional set of 13 Jackie Robinson cards in 1947. These have a different design and are extremely rare. Widely regarded as the most iconic Jackie Robinson card, 1948 Leaf offers the first to be distributed in traditional packs. The design is simple but it's also instantly recognizable. There is some debate as to when the card actually came out. While the copyright on the back says 1948, many believe it wasn't released until 1949. As a result, it is referred to as a 1948 card by some and 1949 by others. Either way, this is one of the most important Jackie Robinson cards in existence. 1948 Swell Baseball Thrills was quick to acknowledge the significance of Robinson's long overdue debut. The set is dedicated to all-time great moments. 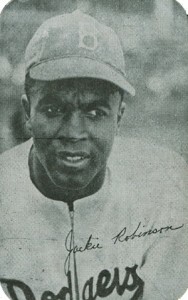 Robinson's card focuses on his place in history, noting his breaking of baseball's color barrier. 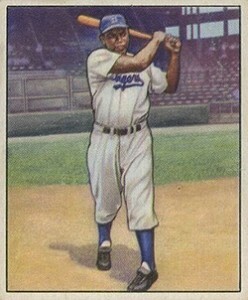 It remains somewhat affordable given its place as one of the first Jackie Robinson cards. 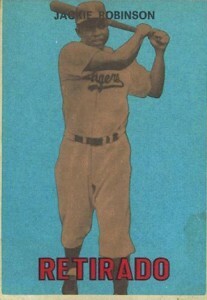 Because of the controversy behind whether hiss Leaf rookie is a 1948 or 1949 card, some consider the 1949 Bowman Jackie Robinson a rookie card as well. Regardless, it's not as appreciated as the Leaf card. The colors are bold in some spots, notably his hat. At the same time, Robinson's face is somewhat washed out. Even still, as one of the first pack-inserted Jackie Robinson cards, it's one of his most important issues. While it might not get the notoriety of the 1949 Bowman card, few will disagree that the 1950 Bowman Jackie Robinson is a much more attractive option. The full-color painting takes a realistic approach. The end result is one of Robinson's most attractive early cards. The 1952 Berk Ross Jackie Robinson is highlighted by a great jumping action shot. The unnumbered card remains much more affordable than most of Robinson's other vintage cards. The 1952 Topps Jackie Robinson is one of his most valuable cards. As if being part of the landmark set wasn't enough, it's also part of the high-number short prints. The bold red background is complimented by a clean portrait. 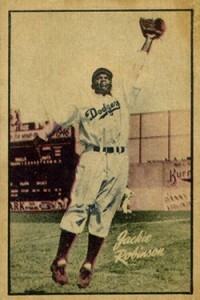 1953 Topps Baseball kicks off with Jackie Robinson. Although a double-print, it's still one of the most valuable card in the set. The painted portrait doesn't totally nail Robinson's likeness. That said, the design is one of the nicest ever put to baseball cards. Between the posed fielding shot and the toothy smile that's look off into yonder, the 1954 Topps Jackie Robinson comes across as far less serious than most of his other cards. 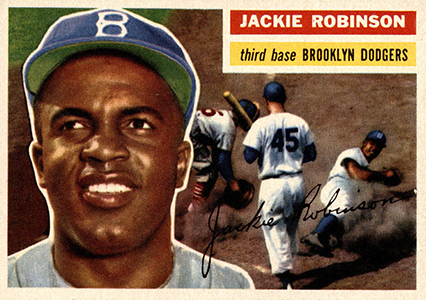 Other than the flipped horizontal design, the 1955 Topps Jackie Robinson has many of the same design elements as his 1954 Topps card. The yellow background is bright, but it's the soft, smiling portrait that the eye is really drawn to. 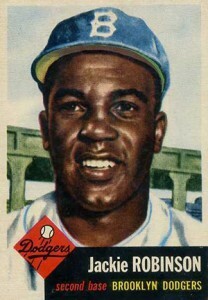 The final card of Jackie Robinson as an active player, 1956 Topps is also one of the most attractive. The portrait is recycled from the previous year but the action background shows a lot more life that the swinging full-body shot from 1955 Topps. 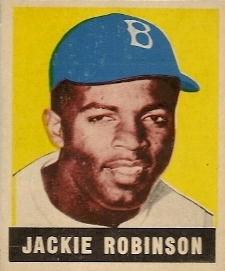 An extremely rare card, Jackie Robinson is in the 1967 Topps Venezuelan set but not the American issue. The Dodgers great is part of a 50-card subset featuring retired players. It has a very plain design dominated by a blue background, which somewhat muddle that sepia photo. Text is in Spanish. I have a Spalding baseball bat, on barrel end it has Spalding, underneath “Jackie Robinson”, then underneath that “Special”. Mid -barrel has a baseball with Spalding through it and on bottom of the ball the numbers 48-115 are printed. I have been unable to find a value for this anywhere. Do you have an idea what it might be worth? I have a cardboard jackie robinson card where he is running across a base. I didnt see anything like that above. Do you know if it would be worth anything? Patricia c mcneer � There are literally thousands of different Jackie Robinson cards so it’s tough to help you identify it. Do you know what company made it or what the copyright year is on the back? I would love to have his official rookie card but the 1952 Topps is just too nice. If I had to pick just one card, that would be the card. I have 2000 Ultra Fleer Jackie Robinson baseball card rare wearing his actual game pants jersey sewn into diamond shape in the card with Brooklyn Dodgers signed by Commissioner and says I’m a lucky winner found in random pack..Do you know of it’s value? Hi. Interested in purchasing a Jackie Robinson 1948 RC. PSA- graded. As always, great article. 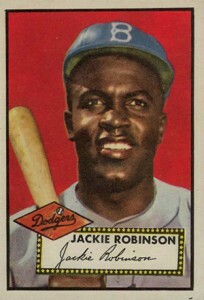 In my opinion, the 1952 Topps Jackie Robinson is the best looking Robinson ever. I also love the ’50 bowman.